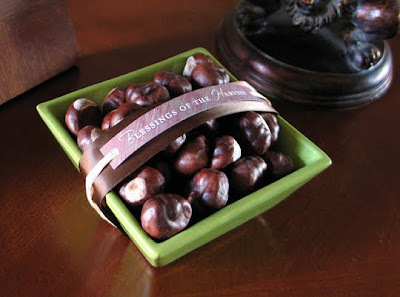 This would also be a cute housewarming or hostess gift! Now, keep gathering those colorful fall leaves - I've dressed up my mantel with more of mine and I'll show you next time! I love all your little tags! They give everything that last little detail that makes them so neat. Oh, I love it! 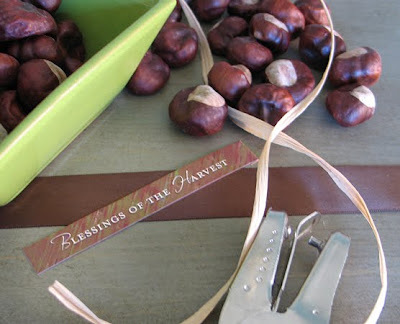 The glossy chestnuts are sleek and elegant while the square dish and woodsy tag add a relaxed spin. I might have to try this. HOW PRETTY! I just love your blog. You have such refreshing, pretty ideas!! Not to mention cute, cute daughter. That is so pretty. I love the hostess idea. I'm always looking for a fun Thanksgiving thank-you. I'll be linking. What a beautiful, simple way to display the bounty of fall! 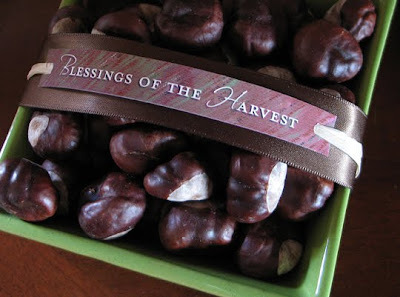 We picked up a bunch of buckeyes at the cemetery last fall and they are still gorgeous! 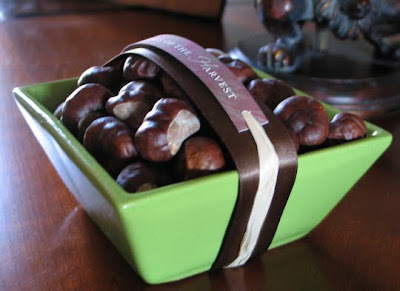 I think your idea for a gift would be great - but even more appreciated if the buckeyes were of the edible sort - you know - the creamy peanut butter filling almost covered in melted chocolate? They are super popular in the 'buckeye' state! What a beautiful and simple idea. Thanks for the inspiration.